A native tree 25 to 40 feet in height and 20 to 35 feet in width. Common Persimmon is slender with an oval-rounded crown, often very symmetrical.The white, fragrant flowers are very sweet and a favorite of honeybees. 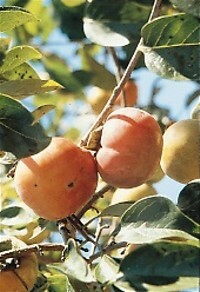 An edible persimmon ripens with a deep orange color after several frosts. More than one tree is needed for pollination to produce fruit. Persimmon tends to sucker into groves or colonies, producing food for wildlife.The hard, heavy, close-grained wood is used for golf club heads, billiard cues, and flooring. No shipments to CA.